It was Throwback Wednesday at the Thunderdome last week, when Cori Close recognized the seeds of UCSB’s success in women’s basketball. 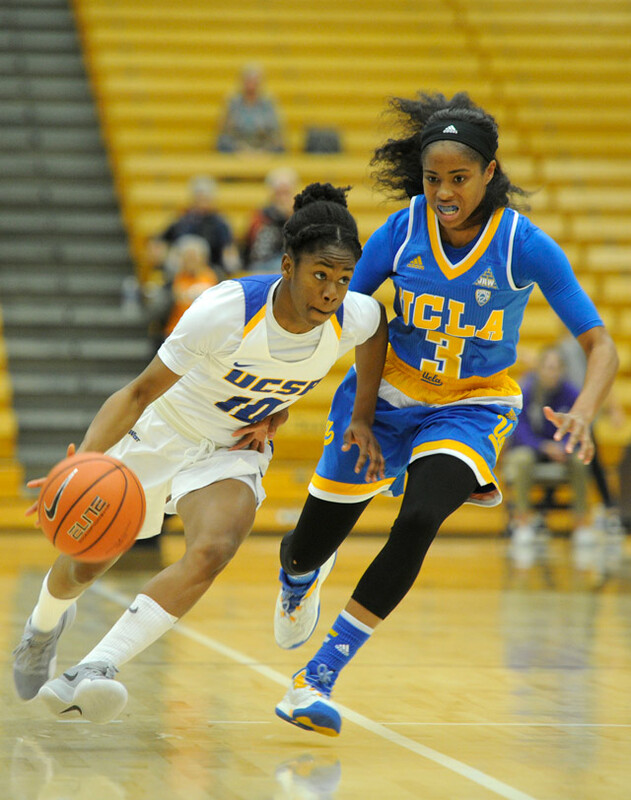 “They out-toughed us; they out-hustled us,” said Close, the UCLA coach, even though her nationally ranked Bruins defeated the Gauchos, 71-52. Close was a hustling Gaucho herself in 1992 and ’93, when she played on the first two UCSB women’s teams to reach the NCAA tournament. “They remind me of my senior year when we started out 0-6 and went on to win the Big West tournament,” she said of the current Gauchos, who came into the game with a 2-6 record. UCSB reached the height of scrappiness after trailing UCLA, 20-7, entering the second quarter. Ripping at loose balls, making 15 defensive stops, and attacking the basket from inside and out — with Sarah Porter drilling two three-pointers — the Gauchos caught up at 22-22, and they heard the loudest cheers at home in some time. 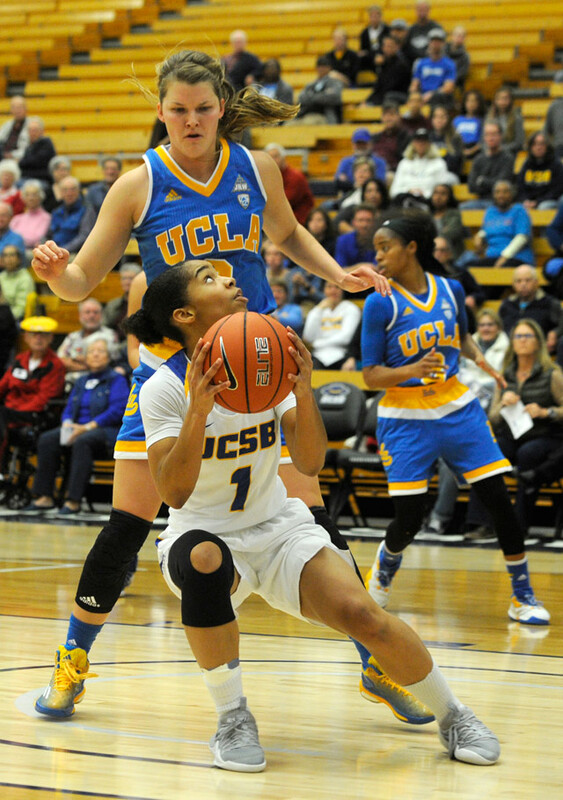 LOOKING UP: UCLA’s Kari Korver looms over Drea Toler (#1), one of UCSB’s small, quick guards. On Monday, the Gauchos’ road trip continued deep in the south of Texas, where they came from behind to defeat Texas A&M Corpus Christi, 66-60. They may look back to that second quarter against UCLA as a turning point. But that’s not to say the Gauchos will ever again reach the heights they did under Mark French, who had Close as his assistant coach, when they went as far as the NCAA Sweet 16 in 2004. 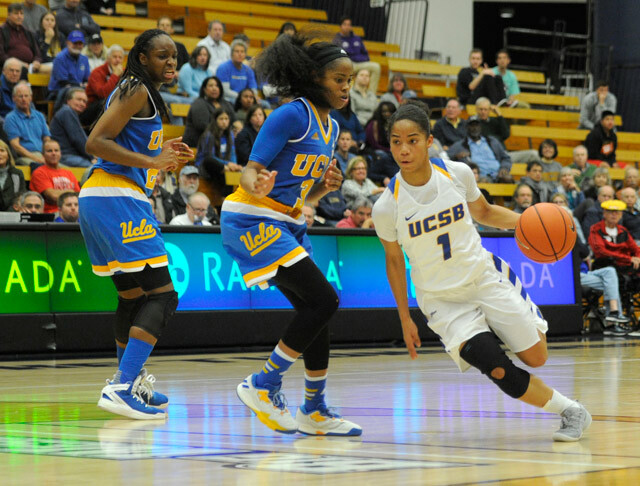 UCSB's Taylor Farris fiercely fights Canada for possession of the basketball. Close herself pointed out in a Q&A with Gaucho fans that the UCLAs and Stanfords have a tremendous advantage over UCSB because of the Pac-12 Conference television package that assures recruits of numerous network appearances. The explosion of social media has also worked against coaches who recruited the old-fashioned way, by building relationships with formerly obscure players in small towns. <b>EMOTIONAL REUNION:</b> UCLA coach Cori Close greets John Reid, who was one of her biggest fans when she was a player and coach at UCSB. 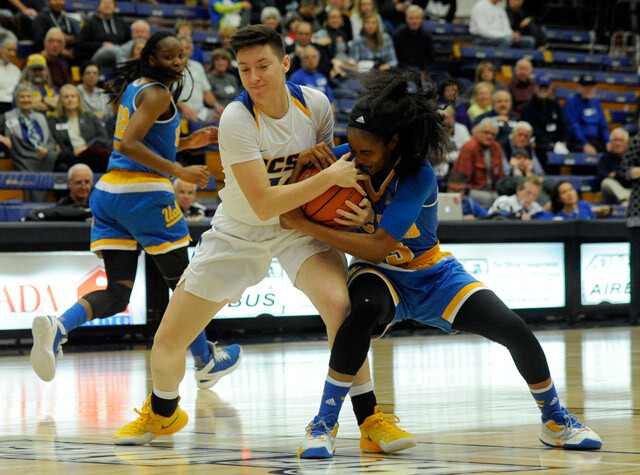 It was out of her affection for UCSB that Close brought the Bruins to the Thunderdome. 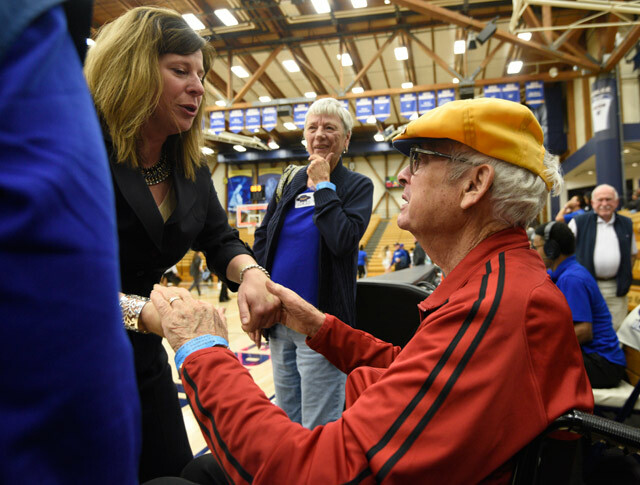 Her homecoming had a bittersweet edge when she paid a visit at courtside to John Reid, the most loyal of Gaucho boosters during the glory years. He attended his first game in a wheelchair since he was diagnosed with ALS. “I got really emotional seeing him,” Close said. There was another UCSB-UCLA clash Wednesday night, a matchup of the men’s teams at Pauley Pavilion. The No. 2 Bruins, playing with the persistence and polish of the Wooden years, cruised to a 102-62 victory. UCSB coach Bob Williams put it well when he noted that UCLA’s super freshmen Lonzo Ball and TJ Leaf are fast developing into NBA-ready players, while the best the young Gauchos can realistically achieve is to stay in school and become solid college players. UCSB’s men (1-7) hope to snag some wins before the year is out at this week’s South Point Holiday Hoops Classic in Las Vegas and two home games next week against Cal State Bakersfield (Dec. 27) and Seattle University (Dec. 30). The Gaucho women will host Yale at noon on New Year’s Eve. WESTMONT’S WINNING WAYS: It could be a special season for Westmont College basketball. The Warrior men (11-1) and women (9-1) both take six-game winning streaks into year-ending action at Murchison Gym. The men will host the 41st Tom Byron Invitational on December 29-30, facing Canada’s University of the Fraser Valley and Cal State Maritime at 7:30 p.m. Each of those games will be preceded by the women’s Holiday Classic, with Westmont taking on Southwestern College and the University of British Columbia at 5:30 p.m.
SBCC REBOUNDING: If shots aren’t falling, Plan B is to hit the boards, and that has been the modus operandi of the SBCC women’s basketball team. The Vaqueros (9-6) rank No. 3 in the state with an average of 51.9 rebounds a game, led by sophomore Destinee King (10.9 average). The Vaquero men (2-11) are getting a boost from Santa Barbara High grad Ben Clay, who had 21 points and nine rebounds against Rio Hondo last weekend. ONCE A DON, ALSO A HUSKY: Former S.B. High basketball stars Bolden Brace and Amber Melgoza are heating up for college teams at opposite ends of the country. Brace had a big second half in Northeastern’s 81-73 upset victory at Michigan State. He buried a three-pointer to give the Huskies a 57-55 lead, and he expanded it to 64-59 by sinking another trey. Brace finished with seven points, four rebounds, and two assists off the bench. Melgoza also plays a reserve role during her freshman season for the Washington Huskies. She made a pair of threes and scored eight points in an 87-36 rout of Savannah State. The Husky women, led by high-scoring senior guard Kelsey Plum, moved up to No. 9 in the national rankings, one spot ahead of UCLA. 12/20-12/23: High School Girls Basketball: Santa Barbara Tournament of Champions In its fourth decade, this tournament has showcased some of the nation’s best teams and players (Diana Taurasi, Sue Bird). Among the 16 teams vying for the Gold Division trophy are Ventura (coming off a 44-41 victory over Harvard Westlake, the state’s No. 1–ranked team), North Torrance, Buena, Hanford, Bishop Montgomery, and Westview of San Diego. Santa Barbara, the defending champion, was matched against Los Alamitos, with sophomore sensation Cailyn Crocker, in the opening round. Another 14 teams will play in the Green Division at San Marcos High and Bishop Diego (except for Friday’s championship and third-place games at SBHS). Dos Pueblos, off to a 7-0 start, is among the division favorites. Thu. : Gold semifinals, 6 and 7:30pm. Fri.: Green championship, 6pm; Gold championship, 7:30pm. J.R. Richards Gym, S.B. High School, 700 E. Anapamu St. Free-$6. Visit sbtoc.com.